This caged turbine in static testing during a gale only experienced a modest boost (~50%) in energy production by being set into a sail. Apparently more of a Venturi entry geometry would help "supercharge" it more, but this sort of placement still looks ideal for AUX power aloft. Its greatest virtue is ease of handling; it does not foul and can survive rough handling. It may be a practical scaling method, to multiply such small units to large numbers in big sails, without cubic-mass penalty growing too fast, or loss of robustness. 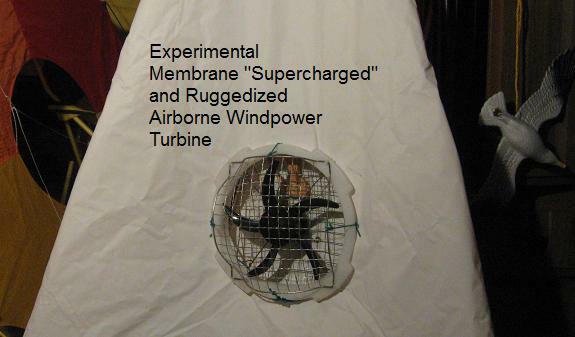 Note the use of 100% scrap; an old DC fan, two light camping grills, a plastic bucket rim, a shower curtain (variable-playsail experiment), etc.